Zeitgeist Stage Presents East Coast Premiere of "Punk Rock"
East Coast Premiere of "Punk Rock"
Zeitgeist Stage Company will conclude its 2012/2013 season with the East Coast premiere of "Punk Rock" by Simon Stephens. Directed by Zeitgeist Stage’s Artistic Director David J. Miller, the production will play The Plaza Black Box Theatre at the Boston Center for the Arts, 527 Tremont Street in Boston's South End, from May 3 - 25. Contemporary and unnerving, "Punk Rock" explores the pressures, underlying tensions and potential violence amid a group of affluent, articulate, angst-ridden seventeen-year-old students as they flirt, bully, and pontificate their way through their senior year and college prep in a British Secondary School. The Zeitgeist production features a group of young actors (including a local high school student), most of whom are relatively new to the Boston theater scene. The cast includes Diego Buscaglia, James Fay, Phil Gillen, Alex Levy, Alexandra Marie Harrington, Alana Osborn-Lief, Victor Shopov, and Emily White. Zeitgeist Stage originally selected "Punk Rock" to be part of their season last summer. Following the devastating events in Newtown, Connecticut, in December of 2012, the Company made the difficult decision to continue with the production. The Company recognized that, while we cannot hide from reality, we can engage in an ongoing dialogue about how and why such events come to pass, and what can be done to prevent them in the future. To that end, Zeitgeist Stage will feature talkbacks with the cast following every performance. Following the Sunday matinee performances the talkbacks will include the participation of professionals who focus on bullying, mental health, and school violence. 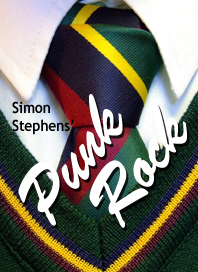 "Punk Rock" is Simon Stephens’ most successful play to date and was a major hit for the Lyric Hammersmith in London. The American premiere of the play was presented by the Griffin Theatre Company in Chicago in January of 2012. Stephens is an award winning British playwright, having won the Olivier Award for Best New Play, the Pearson Award and the Critic’s Award for Theatre in Scotland. The London production of "Punk Rock" was nominated for the Evening Standard Award and TMA Award for Best New Play. The Chicago production was nominated for six 2012 Jefferson Awards, winning three. For tickets and information, stop by the box office, call 617-933-8600 or visit www.ZeitgeistStage.com.